When the weather warms up, sometimes even in colder times, you can find motorcyclists traveling the Kansas City roads and highways. Unfortunately, accidents happen. Sometimes the fault lies with the motorcyclist; but more often, a motorcycle accident is caused by the negligence of another driver. People often assume motorcycle accidents are the motorcyclist’s fault. In reality, many accidents are caused by the negligence of other drivers. 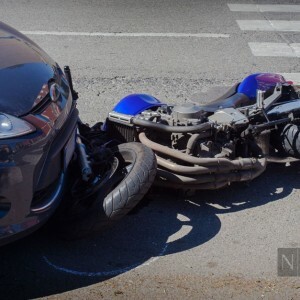 About one-third of multi-vehicle motorcycle crashes are the result of other motorists turning into the path of the motorcycle or failing to yield the right of way. Road hazards such as potholes and uneven heights between lanes can pose greater dangers to motorcyclists. Rear-end accidents can throw a motorcyclist forward off his or her bike resulting in serious injuries and death. Drivers and passengers in parked cars look for oncoming cars but often miss seeing a motorcyclist and cause injuries by opening the car door in the biker’s path. Motorcycle accidents often result in life-threatening or life-altering conditions. Traumatic brain injuries can affect a person’s personality, speech, cognitive and motor skills. Spinal cord injuries may result in partial or full paralysis. Other serious injuries include disfigurement, loss of limbs, internal injuries, and fractured or broken bones. These devastating injuries can leave you unable to work, require ongoing medical treatments such as physical therapy, and lead to a lifetime of costly care and mounting medical bills. Families often suffer lost wages and emotional distress. A wrongful death can devastate family and friends. Have you been seriously injured or lost a family member in a motorcycle accident caused by another? When you need an experienced auto accident attorney in the Kansas City area and across Missouri, the Nash & Franciskato Law Firm will fight for your rights. Contact us for a free, no-obligation case evaluation. Motorcycle Safety Reduces Accidents. Whether you are an experienced motorcyclist or just starting out, motorcycle safety should be top of mind. Understanding the risks involved will help you prepare for the worst. Read the full post.